Alessi are about as cutting edge as homewares get, creating everything from toothpick holders to coffee plungers, fruit bowls and pepper mills and everything in between. Chances are, if it’s colourful or shiny or whimsical, it was borne of an Alessi mind. Have you discovered the Mediterraneo Fruit Bowl yet? Fiery and distinctive, this totally one-of-a-kind piece speaks for itself! Smooth, rounded tendrils of stainless steel reach toward the sky; almost like seaweed swaying hypnotically from side to side in the warm water. 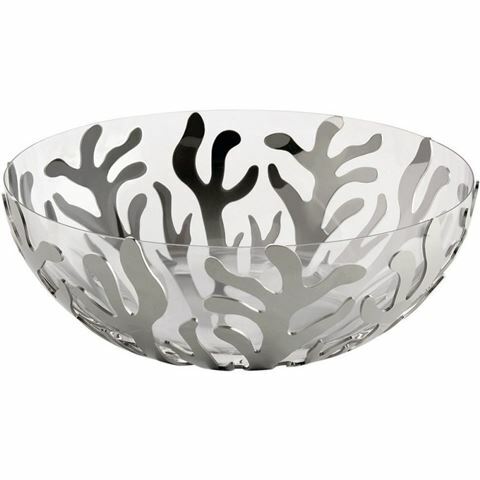 Let the Mediterraneo Fruit Bowl make its bold, unique statement in your home. Exterior made from 18/10 stainless steel, polished to a bright mirror finish. Thermoplastic resin insert is removable. Presented in an Alessi gift box.